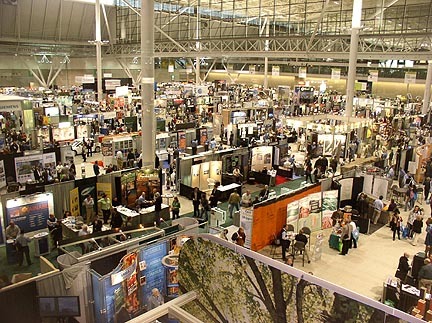 A few years back, I attended the GreenBuild expo when it was in Boston. I try not to incur the footprint and cost of travelling to conferences (not to mention the discomfort that only begins to describe air travel these days), but this was a relaxing train ride from NYC. While there, I walked a few frigid (and empty) blocks to a meeting that was being held at the coincidentally scheduled Build Boston expo. As I entered that show’s exhibit floor, I noticed an immediate and distinct difference. There was a strong smell of new materials – akin to that new car smell – that was totally absent from GreenBuild. The eco-materials and products at the green show were devoid, according to my discerning nose at least, of the telltale scents that probably indicated the presence of volatile organic compounds and assorted endocrine disruptors. I was reminded of that experience when I attended back to back trade shows this past week. On Wednesday, I spent the day at LEDucation 7, an industry show and conference revolving around the advances in LED lighting. (Disclosure: I’m on the board of the group that organizes LEDucation.) 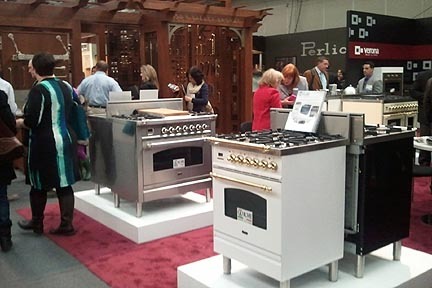 Then the next day I walked the Architectural Digest Home Design Show. I looked at both through the lens of ecodesign and found both encouraging and discouraging points. LEDucation, obviously, is about LEDs and, hence, concerned with energy efficiency. Having attended that show in each of its seven years, watching the growing number of exhibitors and attendees is itself an indicator of the level of interest. With the evolution of LED technology, some of the attention is shifting from displays of raw technology to more sophisticated characteristics like color rendition and control of glare – qualities that affect public acceptance of the mysterious new guy who’s trying to replace the familiar light bulbs we’ve grown up with and that have been the worldwide standard since the late nineteenth century. Not an easy task. The evolution of LEDs has been exciting to see, and the emphasis is broadening from a singular goal of energy efficiency to embrace some of the wider goals of comfort: how does the lighting look and make you feel? How well does it do its job from both a technical and a perceptual gauge? 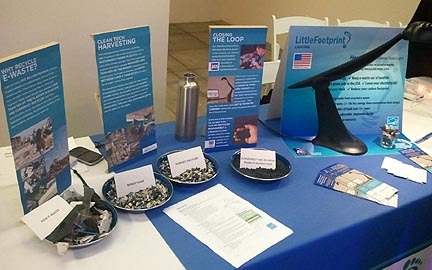 What was missing, with perhaps the sole exception of one of my favorite new companies, Little Footprint Lighting, was any attention to other ecodesign criteria such as sustainable materials and finishes, future upgradability or disposal/recycling. This is not entirely the industry’s fault. One rationale is that the biggest environmental impact of lighting – by far – is in energy consumption. (I’ve personally confirmed this by creating LCAs or Life Cycle Analyses on some of my own lighting designs.) Another factor, at least until relatively recently, has been that LEED (the de facto eco-rating system for buildings) did not count eco-materials and finishes used in mechanical equipment including lighting. So there is a narrow eco focus within the lighting industry. The cutting edge research and development at most companies is in new light sources, without involving the wider picture. On the other hand, there are inventive, usually smaller, companies producing light fixtures from recycled and renewable materials. Unfortunately, they tend to not incorporate light sources other than those incandescent “toasters,” as I call them, or problematic compact fluorescents. Until recently, I could lay claim with my Fire & Water designs to being the only company tackling both energy efficiency and ecodesign. Happily, with the presence of companies such as Little Footprint, that is no longer true. But the separation between design and ecodesign remains; products, by and large, are either categorized as ecodesigned or “regular” design. I’ve posited the disappearance of this division in my “Green Design as (Un)usual” sequence. Prior to the 1960s or so, we had “Design as Usual,” in which environmentalism was not a concern. To be more accurate, Design as Usual before the Industrial Revolution necessarily meant designing to accommodate nature because there was no other choice. The advent of modern building techniques and systems, like central heating and air conditioning, changed that dependency – for both better and worse – leading to the globalization of architecture; the same split-level or glass tower could be built anywhere, regardless of climate. Our present period, with perhaps just a bit of rose-colored vision, could be called “Green Design as Usual” in that we’re beginning to see ecodesign included more frequently and in more (I hate to use the word) ordinary projects. On the near horizon, is a return to Design as Usual, redefined now to implicitly included ecological goals. But we’re not there yet, as was made very apparent by my second trade show tour of the week, the AD Home Design Show. I went in expecting to find a growing emphasis on green design, with much of it falling into the category of greenwashing as businesses attempted to cash in on the movement. While I didn’t find as much greenwash, it wasn’t for the reasons I would have liked. Rather, there was appallingly little evidence of green design – not even the lip service green leaf signs that were sporadically displayed in previous years to flag the “earth friendly.” At one of the few booths that outwardly wore its green colors, Listone Giordano, I asked whether their product literature included information on their renewably sourced woods. When they answered no, I thought they were going to explain that their clients no longer needed it spelled out. Instead they said that their clients were not interested. 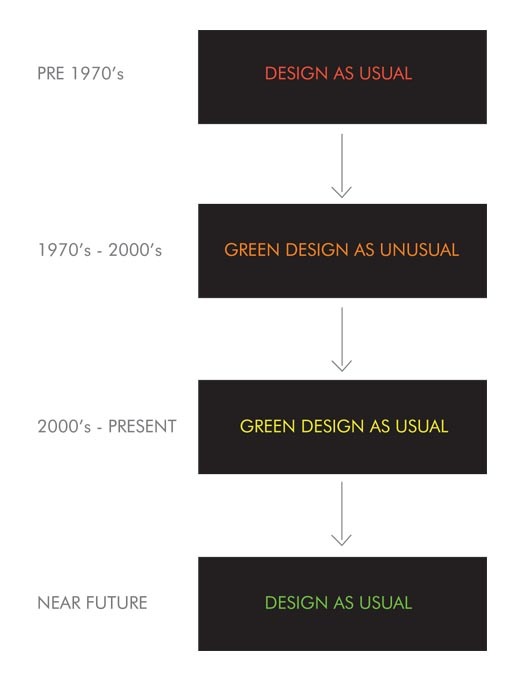 Not a good indicator of our potential to achieve Green Design as Usual, let alone progressing beyond. In fact, if there was a discernible theme to the show, I would have to say it was “excess.” Not what I would have expected amidst just the barest hints of recovery from the Great Recession (in which the building and design industries were among the worst hit). Stashed incongruously within the over-the-top and out-of-the-budget appliance displays, there was a lone small booth showing pervious paving. My bet is that no one outside of a few fellow greenies noticed it. Perhaps the best (or is it the worst?) example of this excess was a display of color glass, flower-shaped urinals. Yes it’s a desirable goal to better integrate nature into our buildings. As the study of biophilia tells us, it generally makes us feel, work, learn and heal better. And there’s also the science of biomimicry: studying how nature does things in order to improve our own methods. But making a urinal look like a flower could constitute only the shallowest definition of biomimicry. (As opposed to a urinal that maybe used natural enzymes to break down the waste into nutrients.) You might say that, rather than learning from nature, these designs piss on it. The observation is not an inaccurate metaphor, unfortunately, for the state of far too much design – even these days, more than 40 years after the first Earth Day. We still regard nature as a resource that we can endlessly take things from and dump things into. My complaint about lighting had to do with seeing light fixtures only in terms of their energy consumption and not as part of a larger system of flows of materials and energy, constrained by the finite limits of a planet. There’s only so much aluminum or oil or neodymium (a rare earth metal used in electronics) to be had. But if the LEDucation displays are any indicator, the lighting industry is at least addressing a part of the problem. Purveyors of brass encrusted commercial-style ranges for homes can’t even make that claim. I know this isn’t exactly an optimistic observation for a blog called EcoOptimism, but it does no good to be blind to reality. The positive take-away is that there are still many eyes to help open, many businesses (and their customers) who do not yet realize that green business is (or can be) good business. What we’re seeing is not so much a direction that’s failed as one that is still finding its footing. This entry was posted in Architecture, Technology and tagged biomimicry, consumption on March 26, 2013 by David Bergman.